This is a story that’s been bouncing around inside my head for at least 10 years now, and it’s only today that I’m going to try to get it out. I hope I can do it justice. Back in the summer of 2001, the Cubs still had a fighting chance around this time of the baseball season (there’s no such luck this year, unfortunately). That being the case, the team went out and traded for Fred McGriff, who had been a star player in the 1990s and was still good for about 30 homers and 100 RBI in a season. When I heard the news, I picked up the phone and called a local sports talk station, waiting to chime in with my opinion on the trade. I liked the trade at the time, because it showed me the Cubs were trying to make themselves a better team. McGriff had a fair shot at reaching 500 career home runs (he ended up with 493 before retiring), and I pointed out to the radio host that it could motivate him to play well for the Cubs. He wasn’t the missing piece of the puzzle for the Cubs, but did play on one of the worst Cubs teams I’ve ever seen the following year, in 2002. The host of the show was impressed with the points I had made, or at least he said that, so he sent me a t-shirt and a sweatshirt with the station’s name on them, and he also entered me into some kind of a drawing for a prize they were giving away. I was happy to just add something to the conversation, but getting a couple of free shirts was nice, too. I didn’t think anything about it until a week later, when I was informed that I had won this forgotten-about drawing, and the prize was a trip to Florida to participate in a fantasy baseball camp. I thought it was a joke, but no, it turned out to be real. The camp was to be held in the fall of 2001, but the September 11 attacks pushed it back until the next spring. And then, along with my brother, I went down to Florida and played in actual baseball games for the first time in decades. The particular ins and outs of the camp were a lot of fun, but I’m going to skip over all of that here. On the last night, after all the games had been played on the field, there was an awards dinner with the campers and the professional players. Among those players was Brooks Robinson, who had been a star player in Baltimore since before I was born. He was scheduled to say a few words, and he was jotting down some notes to himself with a pen. And I noticed that he was writing with his left hand. So I wanted to ask him about that. ME: Hi, Mr. Robinson, I notice that you’re left-handed. ME: I’m left-handed too, but since I throw the ball with my left hand, I was never allowed to play anything other than first base or in the outfield. ROBINSON: Yes, I’m not sure how it happened, but I throw with my right hand and write with my left. ME: It’s a good thing you were able to do that so that you could play third base instead of first. ROBINSON: It confuses people, though. 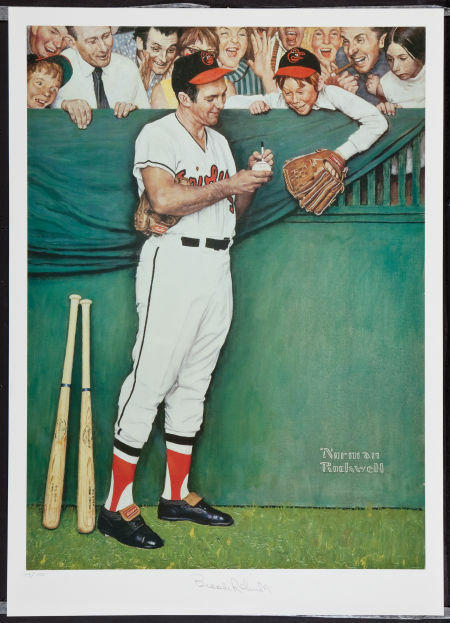 When Norman Rockwell did a painting of me, people sent me letters saying Rockwell made a mistake by showing me with a pen in my left hand. But that’s how I write. After that we spoke for another minute or so, and then I thanked him for his time. He went on and gave his speech to the players, and I got to have a short conversation with another left-hander about being left-handed. If it wasn’t the highlight of the trip, it was still an interesting moment, which I’m more than happy to share in this space. Happy left-handers day to one and all. Well, I think i remember that fantasy camp. Hey bud love your writing. Thanks for the kind words. It’s great to hear from you. Hope everything is going well. I’m on Twitter (@rlincolnharris) if you want to find me, and I’m on facebook as Rob Harris if you want to send a friend request. I still tell people about “the Burgers taste better when you win” line that Rose used. Time sure has flown by, hasn’t it?